First cut a 6" x 9 1/2" piece of Stampin' Up! Baked Brown Sugar card stock and fold it in half for the base, a 4 1/2" x 5 3/4" piece of Stampin' Up! Rose Red for the middle layer, a 4 1/4" x 5 1/2" piece of tissue paper for the front, and a 1" x 5 3/4" piece of Stampin' Up! Rose Red for the strip. 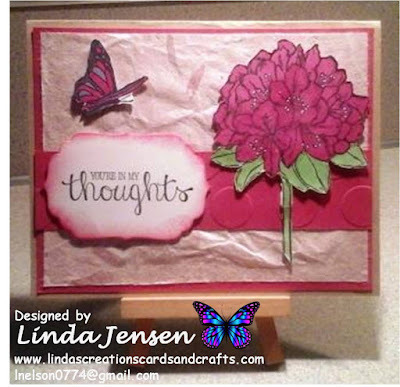 Then carefully adhere the tissue paper background to the piece of Stampin' Up! Rose Red card stock. Next dry emboss the strip of Rose Red card stock with a Stampin' Up! Large Polka Dots embossing folder and attach it to the tissue paper background. 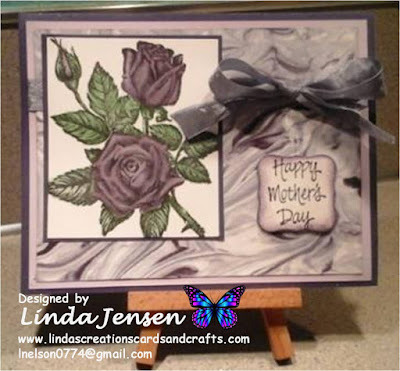 Then stamp the flower on white card stock with Stazon Jet Black ink, color it with Rose Red and Pear Pizzazz ink pads and an aqua painter, then cut it out and attach it to the background with mini pop dots. Next cut out the sentiment with a Spellbinders Labels Four die and sponge the edges with Rose Red ink. Then stamp the sentiment with Stazon Jet Black ink and attach it to the background with mini pop dots. Next stamp the butterfly with Stazon Jet Black ink and color it with Rose Red and Wisteria Wonder inks then cut it out and attach it to the background with mini pop dots. Finally attach the Rose Red layer to the Crumb Cake base and enjoy!